Northend United Youth FC brought their season to a close this week with some phenomenal attendances at their awards nights. Special guests at the senior Awards night included Wakehurst FC chairman Ian Gregg, ex-manager Dougie Stevenson and current player Jamie Speirs as well as long term Northend confidant Paul Frew MLA. Guest of honour at the Junior Awards Night was Michael McClean, current Irish FA Grassroots officer for Mid and East Antrim. A special word of thanks was given to the guests of honour on each night. He went on to give a brief summary of another successful year’s activities for Northend United, including the Club being only the second ever in Northern Ireland to achieve the Irish FA’s Club Excellence Mark 2-Star and thus setting the standard for other club’s to achieve. Sayers was also quick to highlight the partnership that Northend has developed with Blackburn Rovers Community Trust and that the coaches from Blackburn would again be holding a football skills development workshop on Monday 15th and Tuesday 16th August. Northend coaches John Devlin, Alex McDonald, Gordon Patterson, Jamie Pirie, Alan Bristow, Uel Magill, Brian Martin, Davy Wylie, Johnny Day, Brian McCluney and Tony Shaw all gave an account of their team’s performances throughout the season. In addition to all the normal awards, Northend’s Chairman Johnny Sayers presented special recognition awards to Roslyn McCluney, Debbie Sayers, Hazel Coates and Pamela McKeown and thanked them for all their hard work behind the Northend scenes. On the theme of special awards, the Club were pleased to present two U10s players, Callum Burnside and Pearse McAuley with awards for progressing onto the Swansea City Youth academy and Club NI panels respectively. The Club also presented current Wakehurst player and ex Northend stalwart, Jamie Speirs, with an award in recognition of his achievements with Northend United Youth, where he had many successful seasons. 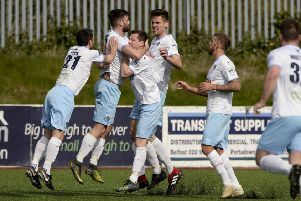 Already planning for next season, Northend United are holding their annual open training nights on Monday 20th and Thursday 23rd June at the Ballymena Showgrounds. The sessions are open to all and will be supervised by Northend’s Irish FA’s qualified coaches. Preparations are now at an advanced stage for Northend’s annual seven-a-side tournament for 2006s which will take place at the Showgrounds 3G and 2G pitches on Saturday 25th June. Following on from last season’s hugely successful inaugural Slemish Cup tournament, Northend United are pleased to announce an expanded tournament, with 32 teams already confirmed.